In the bowl of a standing mixer or with a handheld mixer, mix the flour, sugar, and salt at low speed until combined. With the mixer running on low, add the butter 1 piece at a time; continue to mix until the mixture looks crumbly and slightly wet. Add vanilla and cream cheese and mix on low until the dough just begins to form large clumps. Knead the dough by hand in the bowl for 2 to 3 turns to form a large, cohesive mass. Turn the dough out onto a work surface; divide it into 6 equal parts and roll into a 1 inch log. Let dough rest in fridge for at least 30 minutes. 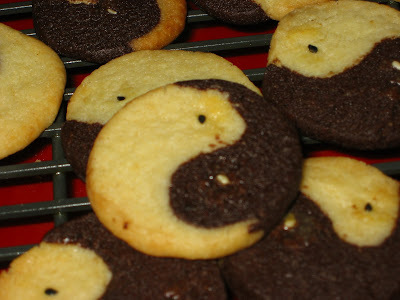 Throughout the process it’s best to work with the vanilla (the yang) dough first to keep it free of chocolate (the yin) flecks. 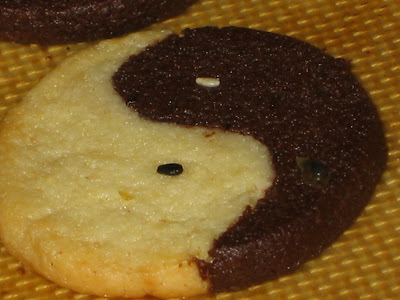 Imagine a 3-D apostrophe when shaping each dough log into its half of the cookie — that’s what a cross section should look like.. 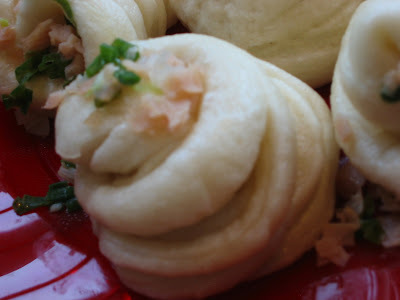 These delicately flavored steamed buns are so named because they are shaped like snails. They are often deep-fried until golden brown after having been steamed. Either way, snail buns are excellent as a subsitute for rice. This recipe defers slightly from 'Flower Buns' and has less ingredients and the texture is just as soft. Lightly grease a bowl with oil and place the dough in the bowl. Turn it so that all sides of the dough are coated. Cover the bowl with a damp cloth and let the dough rise for 4 hours in a warm area, free from drafts. Uncover the dough, punch it down and turn it out onto a lightly floured surface. Flatten the dough and make a well in the center. Place the baking powder solution in the well and gather up the edges around the baking powder to enclose it. Pinch the edges to seal. Lightly knead the dough to incorporate the baking powder evenly. The dough should be used immediately. If that is not possible, punch down the dough after the 4 hours rise, cover with plastic wrap and refrigerate until ready to proceed. Prepare the basic yeast dough as directed and cut it in half. On a lightly surface, roll out each half to form a rectangle approximately 10 by 14 inches and 1/6 inch thick. Spread the surface of one rectangle with half the lard, butter and sugar mixture. Starting with one of the long exges, roll up the rectangle jelly-roll-style. Pinch the two ends to seal the dough; lightly flatten the roll with the heel of your hand. Cut the roll crosswise into thin shreds. Separate the shreds into 15 groups, and let them rest. Repeat the process for the other rectangle. Gather up each group of shreds, and lightly stretch, wrapping them Maypole-style around your index finger and thumb. Tuck the end underneath to secure. Repeat the procedure for all the shreds and arrange the shaped buns 1 inch apart on several steamer trays that have been lined with wet cheesecloth or with parchment paper punched with holes. Sprinkle the tops with the minced ham or grated carrot and/or chopped spring onions, and let the buns rise for 15 minutes, covered. Fill a wok with water level with the bottom edge of a steamer tray and heat until boiling. 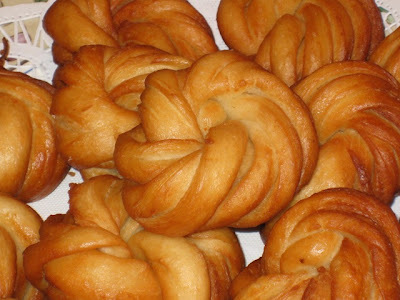 Place one tray of buns over the boiling water, cover, and steam for 15 minutes over high heat. 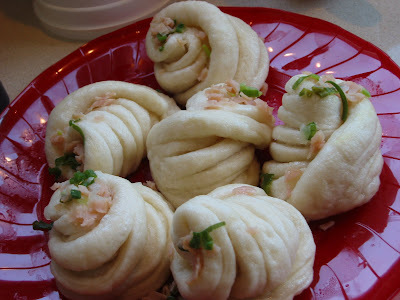 Remove, and steam the remaining buns in the same manner. To reheat, steam the buns for 5 minutes over high heat. 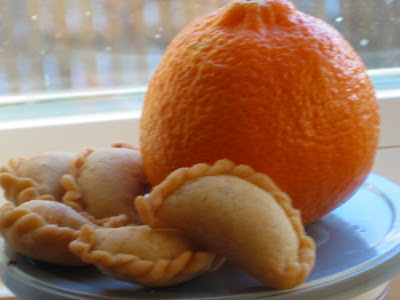 These are must-have for the Chinese New Year and they are so good, it is worth the time spend in making these tiny mini puffs. Using the food processor, pulse magarine , flour and rice flour till it becomes breadcrumbs like. Add water , beaten egg and pulse into a pliable dough. Use the pasta machine to roll pastry into a thin sheet and cut into 1 3/4 - 2 inches rounds. Put in 1/2 tsp of filling into the center of cut pastry and wrap up filling . Pinch edges neatly. Heat up oil for deep-frying peanut puffs and fry till golden brown using medium heat. Remove and drain onto kitchen towel. Let it cool before storing into containers. Frying transforms Steamed Flower Buns into a totally new dish; the crisp, golden crust contrasts nicely with the flufy lightness of the steamed interior. I was told by my friend, Agnes, that these fried buns are very popular in Singapore and they are served with Chilli Crabs. 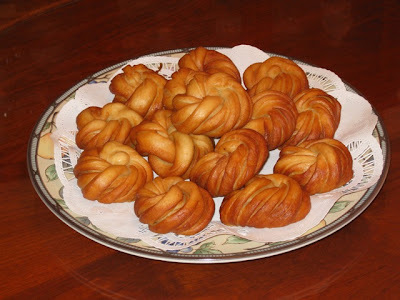 In her recent party, she made Chilly Crabs and i told her that i will make the Golden Flower buns and they turned out so good that guests just ate them straight. Heat oil, add the oil, and heat the oil to 350 f.
Add 2 or 3 of the buns, depending on the size of the wok, and deep fry, turning constantly, until the loaves are golden brown. Remove and let drain on a cake rack placed on a kitchen-towel-lined baking sheet. Deep fry the remaining buns in the same manner. This dish is all about the noodles. Noodles fried in this manner excite your palate with crispy and soft texture at one go. The topping does not have to be seafood, this noodles go well with whatever topping you can dish up - anything available except the kitchen sink. Boil noodles in salted water until al dente. Drain and combine with sesame oil to keep strands from sticking together. Meanwhile, in a wok over high heat coated lightly with oil, brown scallops on both sides, dish out and leave aside. 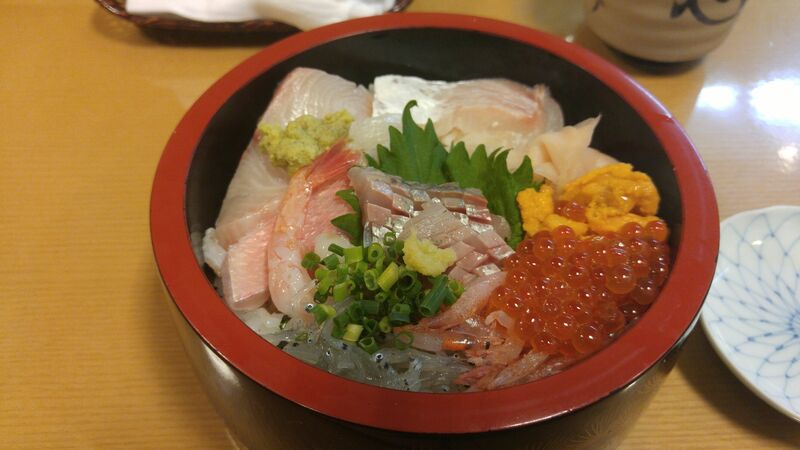 Do the same with all other seafood. Reheat wok with a little more oil and add sliced garlic and stir-fry until fragrant. Add choy sum and stir-fry until tender-crisp. Add in the stock and bring to the boil, thicken with cornstarch solution and lastly add in shao xing wine. Adjust the taste with salt and pepper. 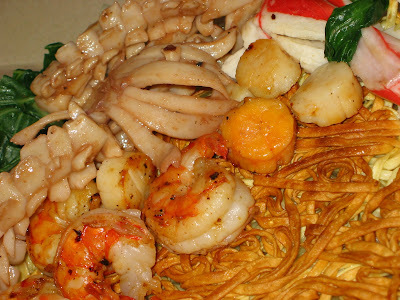 To serve, gently place noodle cake on platter. Top with the seafood gravy, spreading to cover entire surface of noodles.